Description: The 11-year-old Prokofiev presented a complete symphony to Reinhold Gliere, his first composition teacher, in 1902. All that remains of it is this single Presto movement lasting 3:15, discovered by the conductor here in Prokofiev’s archives in Moscow in 2013. Its faster outer sections are not a long way from the neo-Classicism of the Classical Symphony. 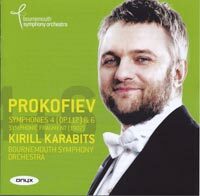 Bournemouth Symphony Orchestra; Kirill Karabits.